Singapore was introduced for a free simulator called Singtel based on nKPRO. I worked on a new configuration for this track removing the wall/fances from the pit entry that was preventing us to use the boxes on the original version. I created two configurations: Box Open and Original. A backup copy of the track.ini is provided. Copy everything in the tracks\ folder. Unfortunately the wall I had to remove was modeled without considering at all the pit entry (this is what happen when u have really tight schedule for the release, and apparently this was the case for Kunos's team at that time). This mean that the "missing" piece is bigger than the pit entry. Not 100% beautiful, but "playable". I'm sorry for that, but this is the best I can do with notepad only! Unfortunately I don't have any nK development kit, and all I'm doing is simply looking at the log files, and reconfiguring the ini files (with notepad...and a lot of patience) and see what is the result in nKPRO. A lot of trial and error, as you can imagine ! I don't know if this is possible, but maybe the one with the nK dev kit may fix that wall! In this case, please, send me a PM and we can work together! Here the latest package done by Stephane. It includes the full track with all the previous changes and some improvements. This is the one we are going to use. I will be online this afternoon from 6 PM on to do some pre-tests. The aim is improving the grid/box/pit alignment. Please join to give me feedback, so we could be ready to do a final package soon. We are thinking to do an other special event on the 24 June, so I hope for this day to have everything settled. This is our program for a test race don t miss...we need a full grid. 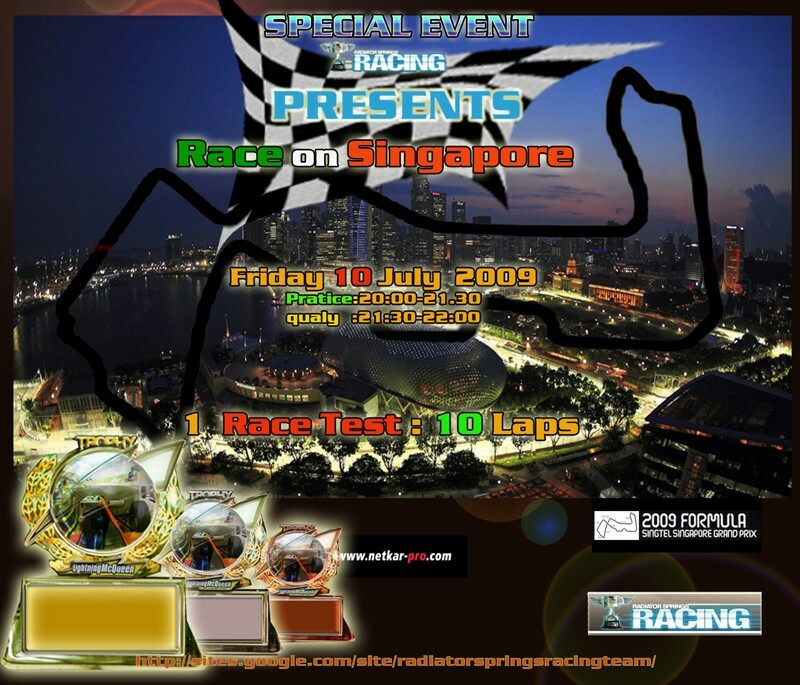 We decided to pospone this event to avoid overlapping our race with Race2Play race. Here we are again! We have a new date for our Special Event on the Singapore track. The appointment is for Friday 10th of July for an other exciting FULL MODE race. thanks to Gianluca and Stephane for their help! It's almost time for the next race! Friday is coming closer! We will be racing once again on Miguel's server (thanks again for your help), and we hope we will finally meet our goal: full grid. We are going to use the the latest package done by Stephane. This beta includes the full track with all the recent changes done by me (Andrea), the new resized textures done by Stephane, and some more improvement he has done and the sky texture done by Gianluca. The following picture describe the pit entrance. As you know we modified the track, opening a hole in the fences to allow us to enter the pits. This is the best we could get. Just be a bit careful, and don't cut too early! Please find the server password in the Password section. Please respect the track rules tonight. This track is really tought because there are armco barriers everywhere just waiting for your mistakes ! The real challange will be to keep your self out of trouble. It's not allowed to disconnect and reconnect in case your car is damaged during qualification, because it's against the Full Mode concept. Nice Hard Race ...was only 10 laps but very hard to get till the end ..well done to all ..always nice to drive whit all of you. Hall of Fame updated. Very well done Stephane. 3 more trophies and you will get the Radiator Springs Hall of fame Cup! Are you going to be the first one??? a lot of great competitors around. Is not gonna be easy! The following drivers are still with an incorrect nKname. Please configure this parameter in GPCOS for the next races.